Family holiday or romantic get away, look no further! A luxurious, modern villa, fully air conditioned, on a small complex of 14 villas. The complex grounds are spacious and fully landscaped and include a swimming pool and sun bathing area. In the evening the complex has path lighting and the pool is also lit. You can sit on the balcony and look out to the Caribbean Sea, which is only a 3 minutes walk away. Within walking distance are shops and restaurants, including "Il Tempio" which was often visited by Pavarotti. Fitts Village is only a few miles north of Bridgetown, the capital of the island. Bridgetown has many shops, bars and restaurants, the cricket ground (Kensington Oval) and horse race track at "The Garrison". Also at Bridgetown you can take catamaran trips up the west coast and stop to swim and feed the turtles. To the north of Fitts Village, passing through "Sandy Lane" is "Holetown" another area where you will find many shops and bars and restaurants. All of this coastline has stunning public beaches for you to choose from. The family bathroom is tiled and fitted with a bath with shower and toilet and basin. There is plenty of shelving and storage and a shaving point. The downstairs cloakroom has a toilet and basin. Next to the kitchen is the dining area with table and chairs. This then leads to the lounge area, which has a white rattan 3-seater and 2-seater sofa, a chair and a coffee table. There is a TV which receives many channels and plays DVDs, CDs and a radio. US style open plan kitchen, with large fridge/freezer and cooker. The kitchen is fitted out with everything you could need for a self catering holiday. There are many golf courses in Barbados and the nearest being the world renowned "Sandy Lane" course. This course is situated less than 5 minutes drive from our villa. Notes on accommodation: A great place for either a family or romantic holiday. 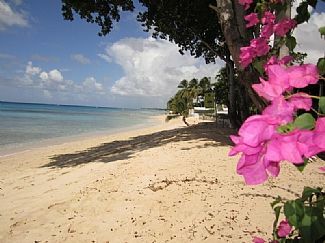 The villa is positioned halfway up the west coast of Barbados, so all the attractions of the island are in easy reach. We would recommend car hire to take full advantage of the beauties to be found in Barbados. Sorry, but no smokers or pets. Outside: The villa is set in fully landscaped spacious grounds. All pathways are lit at night time and so is the pool. The pool is regularly cleaned and checked. There is a sunbathing area next to the pool and around the villa. There is a carpark space allocated to our villa. Utility Room: The utility area has a large top loading washing machine and tumble dryer above. There is a clothes dryer and pegs and basket. We have provided an iron and ironing board. Cleaning / Towels / Linen / Maid service: Weekly cleaning and linen change is included in the advertised price. All linen and towels are included except towels for the pool or beach, please bring your own. Other: There is also a downstairs balcony with views over the pool and this has a small table and 2 chairs and outside light. We have provided for your use a telephone to make local calls. We now have the internet and have installed free wireless broadband. Advance communication with Adrian was much appreciated and we spent a wonderful 10 days here. This pretty, semi-detached villa is one of several similar, set in a peaceful, safe location with beautifully tended communal gardens. Although a nice beach is just minutes' walk away, the pool is a real bonus. The villa was very comfortable, well-equipped and spotless (thank you, Monica and team) and we soon got used to the early morning, neighbouring cockerels! Public transport links are reasonable, but hiring a car is definitely worth it. Party animals might find it a bit quiet, but if you're after a totally relaxed, chilled out stay on the west coast, we can highly recommend. We'll certainly be back! We were there for a wedding on Fitts Beach. We were able to walk to the beach and found a driver who gave us his card and was able to pick us up for every other ride we needed. Note that this is not a resort. You are immersed in the local culture and we loved it. We felt safe and found the local people to be kind and genuinely caring toward tourists. The grocery store down the street even provided a grocery shuttle. The air conditioning was a life saver! And the accommodations were very nice. If we find ourselves in Barbados again I will definitely be back. Just a note.... there was a drowning and a near drowning at Fitts beach while we were there. The water looks calm, but locals warned us about unmarked undertow. I am sorry about the local noise, but the villa is in a residential area. I think the point about outside furniture may have got confused in translation? we have 3 tables (1 on each balcony and a folding one for the beach) and 4 chairs and 2 sun loungers. There are fantastic beaches all over the island, but our villa is positioned on the best coast line of them all the "Platinum coast". All the beaches are public and can be accessed by walking down public pathways signposted from the road. The beach at Fitts has clean pinky/white sand leading down to the crystal clear warm water of the Caribbean Sea. When sunbathing you can often see the head of a passing turtle feeding in the shallow waters. The villa is a 40 minute drive from Grantley Adams airport, where you can collect your hire car or taxi. We can help with discounted car hire,or arrange a taxi to meet you, just ask. The villa is 10 minutes drive north of Bridgetown. The nearest supermarket is only 1 minute away by car and the nearest banks and retail shops are by Holetown a 5 minute drive north. WiFi, Air conditioning, a weekly clean, all linen (except beach towels) and a cot and high chair. We can arrange a taxi from the airport, help with car hire, food shopping for your arrival, a babysitting service and a cook, just ask. Booking Notes: Please make your booking on this site our ours, www.blueskylettings.com Booking deposit is 50% with the balance payable 3 weeks before departure (unless a last minute booking, when all will be due immediately) Changeover Day: We wish to make it as easy for our guests as possible and therefore we operate an any day changeover.